The Credential of the Camino de Santiago, successor to the original document given to the pilgrims during the Middle Ages and that was used as a pass, is a document given to walkers to certify them as a pilgrim and serves to record their passage through distinct locations along any of the pilgrimage routes. It is like a guide to the Camino de Santiago in which the pilgrim is registering your trip. This is done through the use of stamps collected by the walkers in the pilgrim hostels, councils, parishes and even shops and bars, and, upon reaching Santiago, serve as evidence to obtain the Compostela, the official text to certifies that walkers have completed the Way and, is applicable to those who have covered at least, the last 100 kilometres on foot or on horseback or, if by bike the last 200km, for spiritual reasons. 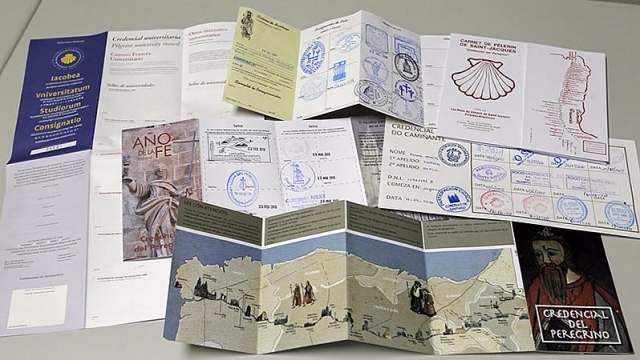 The official Credential for the Camino of Santiago includes, on its first page, personal information about each pilgrim, a space for the stamp from the entity that provided this “passport” and another one for the cathedral to be stamped upon completion of the itinerary. The rest of the foldable pages have a series of white boxes that can be used to collect a variety of stamps from hostels or other locations passed as they progress along the Camino. In the Pilgrim’s Office -the place where the Compostela is collected on reaching Santiago-, walkers are required to have collected at least one stamp per day, two on the Galician stretch of the Camino if done on foot (the last 100 kilometres) or over the last 200km if done by bike. To receive the Compostela it is not necessary to have completed the Way ​​over a continuous period of time, although geographically continuation is mandatory. That is, the pilgrims can complete a stage of the itinerary and then, later, resume the route and continue sealing Credential of the Camino of Santiago at the point where they last left it. It is not valid, however, to miss out a stretch of route and continue sealing in a different location. Where can I get the credential? There is an official form of acquiring the credential and accepted by the Office of Pilgrimages of the Diocese of Santiago. Pilgrims can request in this office (located close to the Cathedral of Santiago, in the Rua do Vilar 1/3) or in other institutions authorized by the cathedral of Santiago for distribution, such as parishes, Associations of Friends of the Camino of Santiago, pilgrim shelters, fraternities, etc. . In the Friends of the Associations it is possible to apply for the credential up to one month before starting the Camino on presenting ID. Normally it is handed over instantly. If at the time of starting the pilgrimage the walker has failed to obtain a credential, they can normally acquire one at their first hostel or at tourist office at the beginning of their pilgrimage route. This guide specifies the locations where walkers can or can’t purchase it. The price of the Credential for the Camino of Santiago ranges between 50 cents to two euros. Outside of Spain, several associations related to the pilgrimage have been authorized to distribute their own credentials. The Credential, a document of 14 pages and 16×19 centimetres, identifies the pilgrim but does not give them specific rights. It has two practical purposes: it allows for accommodation in hostels and functions as accreditation to request Compostela on arriving to Santiago. It also allows the walkers to benefit from pilgrim menus offered in many restaurants on different pilgrimage routes, especially on the French way and hikers can take advantage of discounts that various other accommodation establishments reserve specifically for those who have the credential. Those pilgrims who choose to continue the route to Finisterre or Muxia and, who still have free space in their credential can continue collecting stamps in this document. However, those who have already completed their credential and want to obtain another one to continue way to one of these two coastal towns (both in Finisterre and Muxia the council issues a document to certify that they have completed these Caminos) should buy another special credential in the tourist office of Santiago, not in the pilgrim office. Alongside the official credential, there is another valid document, which allows walkers to obtain the Compostela on arrival to Santiago. This is known as the Jacobean University credential, a model issued by the University of Navarra, it is part of an initiative launched in 2002 with the aim of extending the Camino of Santiago among the university community, on an international level. The university Accreditation can be requested over the Internet, or in the case of being in Pamplona, can be collected, in person, from the building, Central de la University de Navarra. On this document, and aside from the usual stamps collected by walkers on the traditional credential, pilgrims are asked to have the credential stamped by the universities passed along their itinerary. In this way, and, after arriving in Santiago, the walker will be entitled to, not only the traditional Compostela, but also the Jacobean University Certificate (the University compostela) to certify having completed the university pilgrimage to Santiago. To acquire the University Compostela pilgrims should send by post, email, or alternatively, they can visit the student Office in person (Campus Central building of Pamplona) and submit the original or, a photocopy of the university credential complete with the university stamps, the traditional stamps collected along the Way, the stamp of their University of origin and that of the pilgrim Office which collected the Compostela at the end of their journey. Once the office has received all the necessary documentation from the University of Navarra, the Jacobean University Certificate will be sent to the home address of the pilgrim.